In 2011 the Thai Wongphanlert family opened 137 Pillars House Chiang Mai, a 30-suite luxury hotel occupying a beautiful renovated 19th-century colonial building that was once the headquarters of the East Borneo Company. Such was its success that the family decided to create 137 Pillars Hotels & Resorts and export the ideals of that first property to other parts of Thailand through carefully curated hotels and residences that, in the words of COO Christopher Stafford, “deliver an outstanding and memorable experience for every guest and resident”. In memory of the Leonowens and Bain family who lived in the original teak homestead in Chiang Mai (which sat on 137 pillars to protect it from river flooding – hence the company’s name), each new hotel in the brand will feature a Jack Bain’s Bar and Cigar Divan and the elite Louis Leonowens Club for “by invitation only” guests. 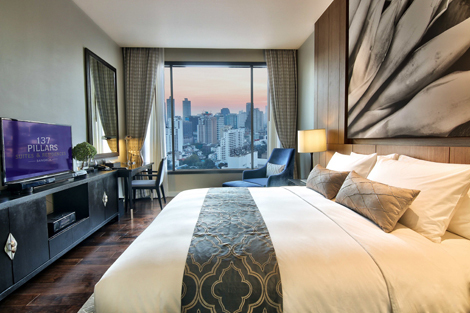 The new brand’s website launched in April (137pillarshotels.com), and its newest edition, 137 Pillars Suites & Residences Bangkok, is scheduled to open in February 2017. The property is located on Sukhumvit Soi 39, a short distance from the upscale and fashionable shopping district of Emquartier/Emporium. 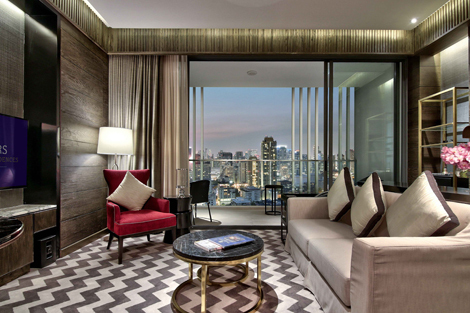 137 Pillars Suites & Residences Bangkok will showcase 34 lavishly appointed suites, ranging in size from 70 sqm to 127 sqm, and 179 private residences covering 40-91 sqm. The architects for the property are Palmer and Turner from Bangkok, with interiors by P49 Design and landscaping by Wabi Sabi Studio. 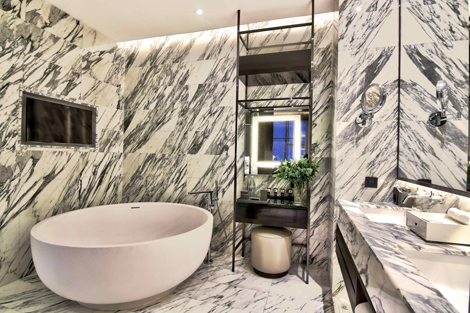 The interiors showcase a warm palette of rich tones with exquisite white-and-grey marble bathrooms and expansive use of mirrors and glass. The hotel suites (both one- and two-bedroom categories) are located on the 24th to 32nd floors, and will feature spacious balconies (boasting a signature rocking chair and oversized daybed for two), circular baths complete with built-in TV, and a private butler service. F&B options will include Jack Bain’s Bar; the Nimitr speciality restaurant featuring both Thai favourites with a molecular twist and Western delicacies, created by group executive chef Peter Marx from Sweden; and the Bangkok Trading Post Restaurant on Soi Sukhumvit 39, an all-day dining bistro and deli serving Western and Asian favourites as well as freshly baked bread, connoisseur coffee and speciality beverages, to go or dine-in. Additional features include a Sky Bar and rooftop infinity pool on the 32nd floor, plus a spa and wellness centre. A number of unusual services and unique offerings stand out for this property. Each guest will be given the use of his/her own mobile phone with a local sim card for the duration of their stay, while for guests connecting to the Bangkok BTS Skytrain and MRT underground trains, a fully air-conditioned tuk-tuk shuttle will be available – and in a first for Bangkok, this will have onboard wifi. Other services include a personal shopping service and guide, privately curated and customised tours, and tennis and golf practice (putting and chipping) with a personal trainer. Guests booking direct also get fast-track immigration services at the airport on arrival and departure. A third property, 137 Pillars Estate Phuket, is scheduled to open in early 2019 on the north peninsula of Kata Beach, with 16 sunset-facing pool villas and 51 pool suites.